Starring: Chris Pratt, Jennifer Lawrence, Michael Sheen, and more. Requested Review from Evan Wallace! While creating quite a bit of buzz before its theatrical run, ‘Passengers’ became a a topic of conversation in the entertainment world due to its high-powered duo cast and a curious story line that made people debate what it could truly be about. I happened to miss this film when it had its theatrical run but my brother, Evan Wallace, caught it and loved what he saw. He said I just had to see it and so here we are! Oberrated coming at you with another Requested Review and this time on the sci-fi drama that is ‘Passengers’. Starring Chris Pratt and Jennifer Lawrence. As the spacecraft, the Starship Avalon, is traveling on a 120 year trip to a livable planet called the Homestead Colony, it runs into an unexpected malfunction that causes two passengers to awaken prematurely. Creating an undesirable yet also mysterious path ahead of them. 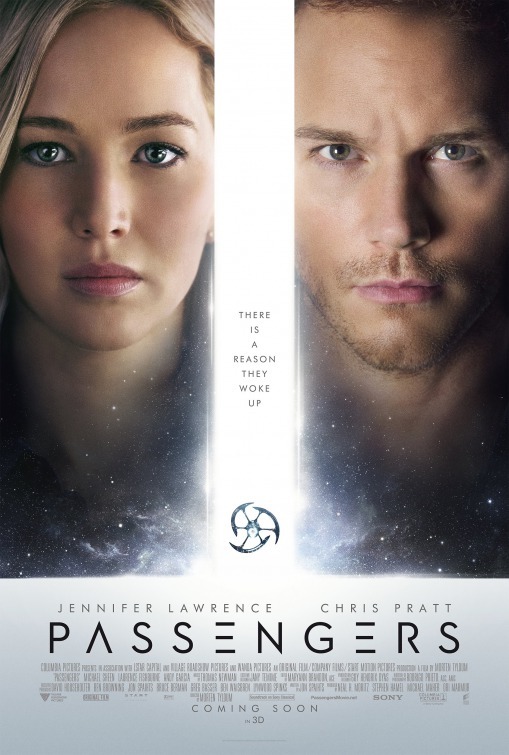 ‘Passengers’ was quite a creative flick that threw a wide range of emotions at myself and possibly other viewers. Impressively enough, I was shocked to see how well the film kept me invested, considering the minimal characters and such a simple story line. So here is the breakdown. As I previously stated, this plot can be seen as a simple one. Passengers aboard a spacecraft wake up due to unforeseen circumstances. What mysteries will they face? Can they go back to sleep? Why exactly did they wake up? What do they do next? A very ABC type story but impressively, as the story continues to develop, more and more obstacles are presented to the cast, both physically and emotionally. The story develops and becomes complex as the run time goes farther and to myself, it was enjoyable to view and always changing. Keeping me on my toes and invested in what was happening next. With such a limited amount of cast members, there is truly only two main character and two supports. The limited characters carry the film well and again, I was impressed by the performances. Chris Pratt presents his wide range of skill beyond his cocky a**hole type that he does so well and keeps you immersed in a struggling character facing his tough decisions for survival. Jennifer Lawrence continues to show she is an A+ actress, beyond her early years, as she immerses herself in her roles. Her desperation for survival and also her struggle, as well, to figure out what will be the next step toward her seemingly inevitable demise is gripping to watch. Although, I was never impressed with her Katniss Everdeen, I struggle to avoid seeing the flashes of her then performance in her more recent performances but nonetheless, ‘Passengers’ was another great one of hers. Minus just a few scenes I thought were weak for her. Honestly, beyond Chris and Jennifer playing the main roles, I thoroughly enjoyed Michael Sheen as Arthur, the android bartender. His charisma carried the scenes he was involved in every time. He was a joy to watch and is quite possibly the most memorable of the small cast. ‘Passengers’ was quite beautiful to view. Every time a scene cut out to space and viewed the ship from the outside, it was honestly immaculate to watch. I loved many of the scenes involving the movement of the ship and how it was interacting with its outside environment. I felt it was strong enough to give some focus to in the review. So ‘Passengers’ is another strong performance for the Sci-Fi genre. I am honestly upset now that I missed this in theaters because the experience was probably multiplied for the better if I had seen it in one. An ever-changing story, strong performances, and overall just an enjoyable piece of film. Definitely worth the watch. Posted in 2016 Movies, Movie Review, Oberrated Requests.Tagged Chris Pratt, Jennifer Lawrence, Morten Tyldum, Passengers.